Just some days ago we wrote about the Dream G2 Phone “Made in China” that looks like Android but isn’t one. On that same show I took a flyer with their product showcase and it listed not just the fake Android phone. 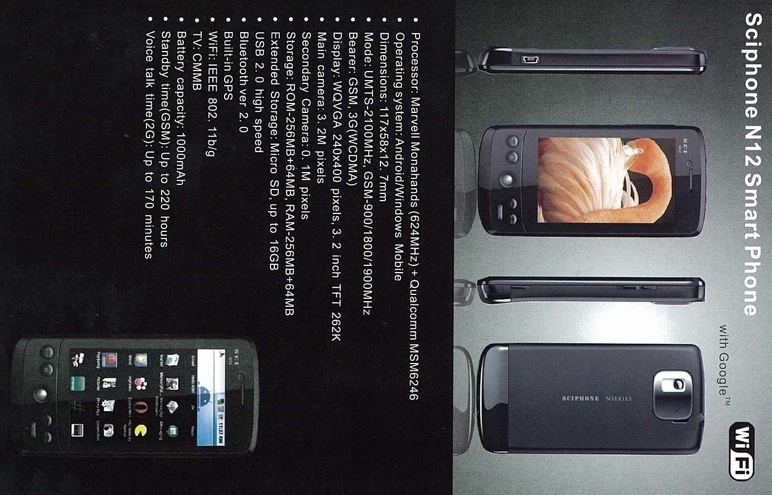 Bluelans actually plans to publish a real Android powered mobile phone in July 2009. At least that’s what they told me. I am not sure if they can hold their roadmap and release but it would be great to have another Android on the market! When I saw the fake one I first thought: “Why don’t they just take the free Android OS and put it on a phone rather than using a crappy Chinese OS and lots of programmers to wirte a fake Android User Interface? Here you can download the original scanned Flyer which I took from the fair: N12 SciPhone with real Android OS Flyer. The android phone is real. Prototype is in testing at present. Gps and 624mhx proccessor will blow you away. Some pages say this phone has 850 MHz, others say it is quadband. But if it is quadband, this could be the phone that changes the game. he Dream G2 with wifi is still a Dream G2 it just has wifi this time around. In other words it’s not going to run Android instead it just has a cloned interface which given the hardware is likely too weak for Android anyway (at best it has a 208mhz ARM9 mhz which barely meets the minimum recommended for Android) is probably a good thing. However Sciphone have an N12 listed that may really run Android. Yes N12 with real ANdroid is getting closer. I hard they are preparing for beta testing in coming weeks. I heard the same thing from some of the distributors we have daily contact with. Also asked Bluelens and they said it should be released in June. If they meet the schedule, it should be a great phone with lots of potential. Where from I get N12 in India and what will be the price? When will it be avalible in the US and how much will it be? it should be a great phone with lots of potential. In other words it’s not going to run Android instead it just has a cloned interface which given the hardware is likely too weak for Android anyway (at best it has a 208mhz ARM9 mhz which barely meets the minimum recommended for Android) is probably a good thing. It has a 624 Mhz chip, which is enough to run the real Android OS. Previous Sciphones have been imitations, but I believe the N12 is their first real OS phone. I like android!! but there are no android phone in korea..yet..
Android 2.2 mobile phone A5000 (GPS, Dual sim, TV) is only USD $125, SXD International Ltd. are wholesaler of Android Tablet PC and mobile phone in China. You can visit our website http://www.netacce.com for more information.